Please call boat owner Ronald at 315-767-7910. 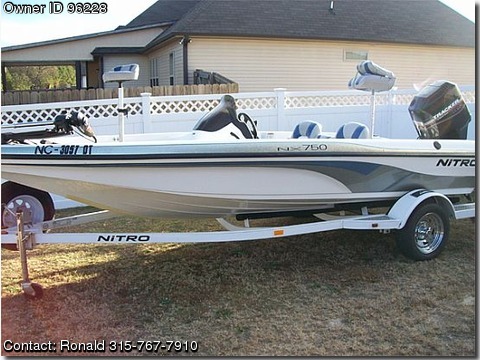 THE 2005 NITRO 750 NX BOAT AND NITRO TRAILER ARE IN VERY GOOD CONDITION, WITH SOME MINOR WEAR AND TEAR ON THE SEATS. HAS A TRACKER 115HP 2 stroke engine powered by Mercury. I HAVE CLEAR TITLES TO BOTH THE BOAT AND TRAILER. THE BOAT COMES WITH TWO SETS OF KEYS, DRIVER MOUNTED LOWRANCE X-47TX FISH FINDER, MOTOR GUIDE 5 SPEED 40 lbs THRUST TROLLING MOTOR, REMOVABLE FRONT AND BACK DECK CHAIRS, BATTERY CHARGER AND TWO NEW BATTERIES BOUGHT 2013, MOUNTED SPARE TIRE, SWING AWAY TONGUE, AND NEW BOAT COVER, AND A FEW OTHER ITEMS. THIS BOAT PICKS UP TO 45mph-50mph WITH NO PROBLEM. MAY BE A LITTLE TOO FAST FOR FIRST TIME FISHERMAN BOAT. THIS BOAT HAS TWO LIVE WELLS, TWO REAR STORAGE COMPARTMENTS, TWO FRONT LONG COMPARTMENTS CAN BE USED FOR RODS AND TACKLE. AND A CENTER FRONT DECK COMPARTMENT CAN USED TO STORE UP TO FIVE LIFE VEST.